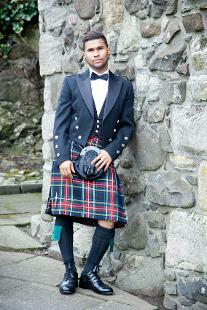 We have a range of kilt packages to choose from. You can use them also as a guide and make changes to them to suit your needs. We'll be happy to sit down and help you make the right choices and we have a selection of sample books to help you with your choice of tartan and jacket. 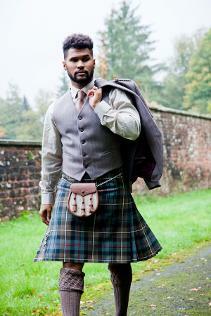 All of our kilts are made to measure in any commercially available tartan. Please allow 4 - 6 weeks for the making of your kilt. 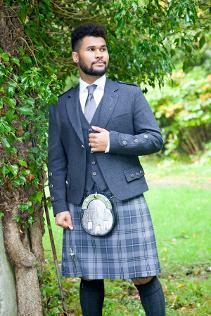 We can order in special weave tartan for our customers where the chosen tartan is not available from the mill. 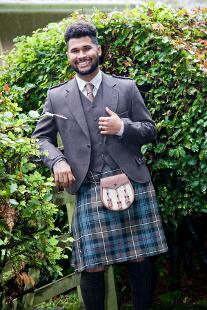 The price for a special order kilt is currently £699. 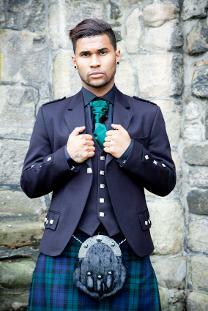 The Clunie jacket set made by House of Edgar of Perth, comes with a 5 button waistcoat. This beautiful herringbone jacket set comes in a choice of Russet, Moss, Lovat and Black. The Crail Jacket and waistcoat by House of Edgar is a beautiful woollen set. It comes in Peat (pictured), Midnight, Graphite, Charcoal and Twilight. 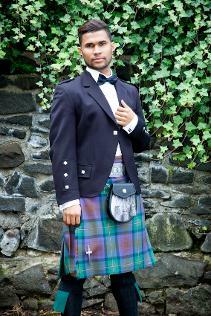 Our kilts are made with a minimum of 8 yards of either 13oz or 16oz worsted wool. 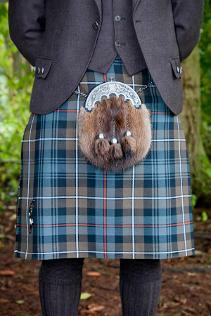 All of our cloth is woven within the UK, and our own Scottish kiltmakers. 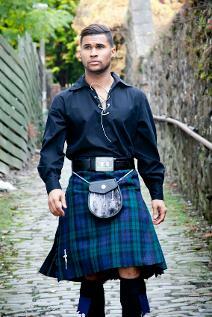 Our 8 yard kilts are suitable for waist size up to 46". We will use additional cloth for bigger waist sizes, and a charge of £30-£40 per yard will apply. 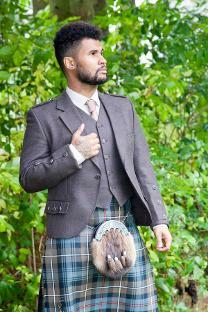 This is an Arrochar Tweed jacket and waistcoat set, with imitation staghorn buttons. Sizes start at 36"-56" with either short, regular or long sleeve lengths.